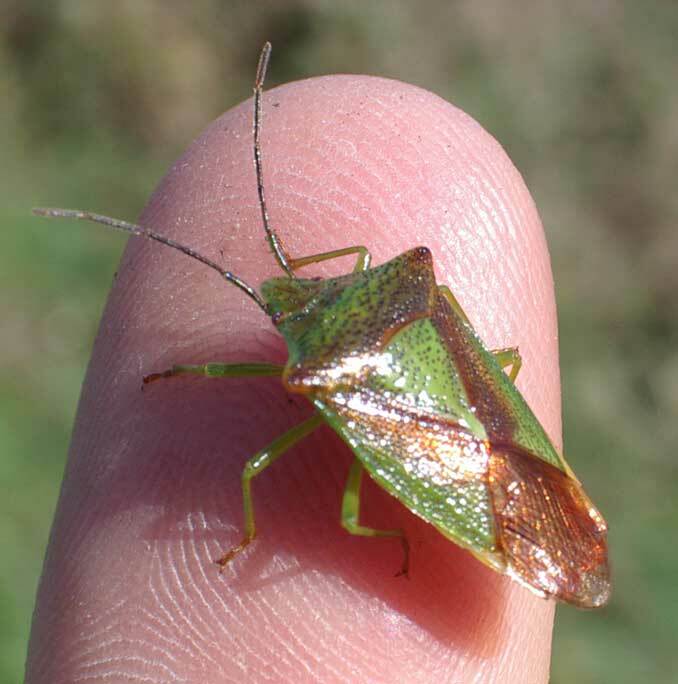 My first bug of the year seen in a short flight over the Waterworks Road, Old Shoreham was a Squash Bug, Coreus. 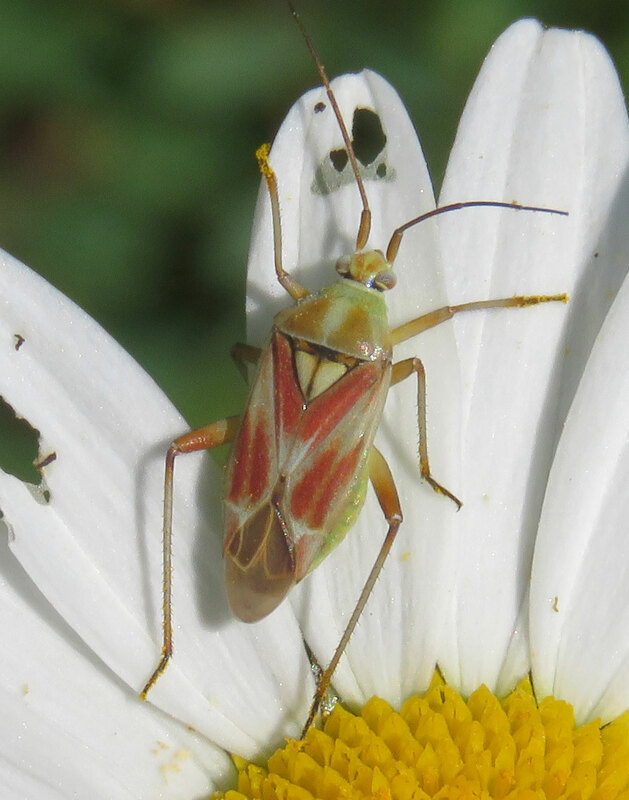 A small bug on Ox-eye Daisy on the steeper slopes of Mill Hill was my first ever record Calocoris roseomaculatus. 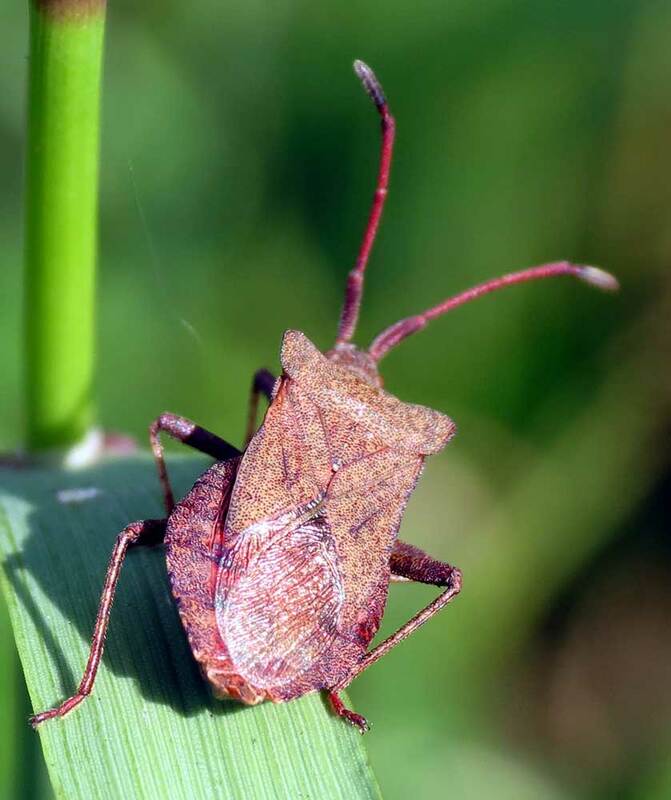 This beautifully marked bug is found throughout Britain in dry grasslands, where both adults and larve feed on a range of composites such as Bird's foot Trefoil,Restharrow, Salad Burnet and Kidney Vetch. 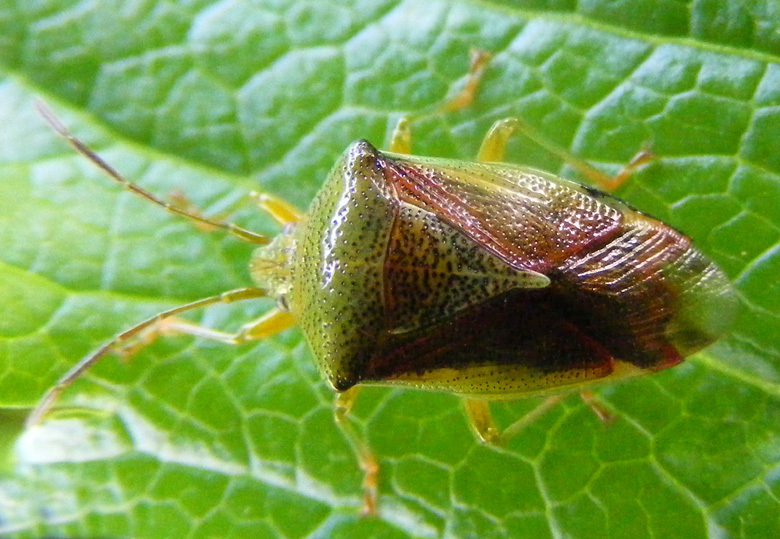 A Common Green Shield Bug, Palomena prasina, rested on an Alexander leaf on the verge if the area of mown grassland at the top of Chanctonbury Drive, north Shoreham. A Squash Bug, Coreus, rested on an Alexander leaf on the verge of the Waterworks Road, Old Shoreham. A Common Green Shield Bug, Palomena prasina, rested on an Alexander leaf on the verge of the Waterworks Road, Old Shoreham. 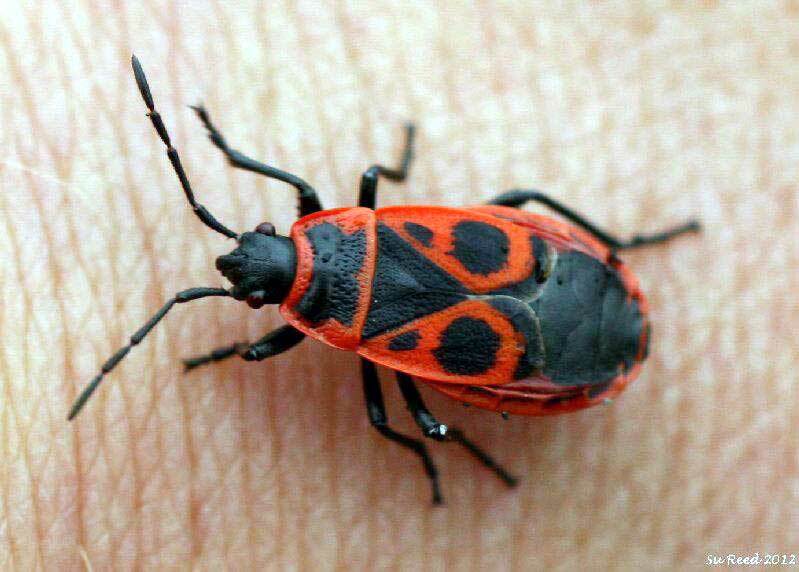 This Fire Bug, Pyrrocoris apterus, was photographed at the end of April in Sompting, under the Mallow plants beside the A27 just on from Lyons Farm. They were mating. At the top of Buckingham Park, Shoreham, I spotted my first shield bug of the year: the Hawthorn Shield Bug, Acanthosoma haemorrhoidale. 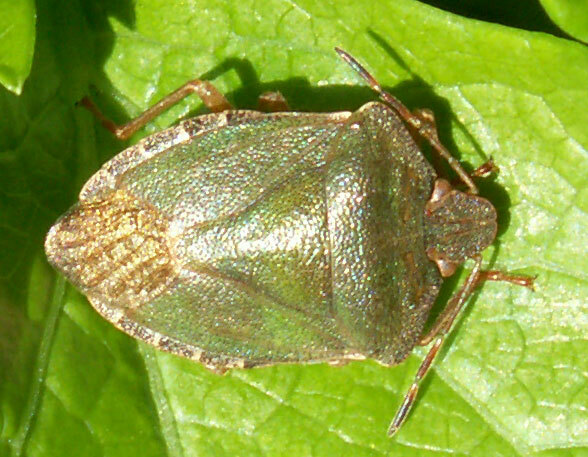 The whirring green insect that landed on me was a Common Green Shield Bug, Palomena prasina, the first noted in 2009. This small bug was spotted on Green Alkanet on the Waterworks Road, Old Shoreham. This bug rested on an Ivy leaf on the western part of the Pixie Path. This must be the Common Green Shield Bug, Palomena prasina. This bug rested on a Bramble leaf on the northern part of the Slonk Hill bank near the road signs. It was the only one seen. Squash Bugs, Coreus, have been seen in the last few days, a few at a time and mostly ignored. My first Squash Bug, Coreus, of 2007 was seen clearly in the Butterfly Copse, near the Waterworks Road. In a brief burst of early afternoon sunshine, I came across my first bugs (x 2) of the year at the top of Chanctonbury Drive (SE of the bridge to Mill Hill). 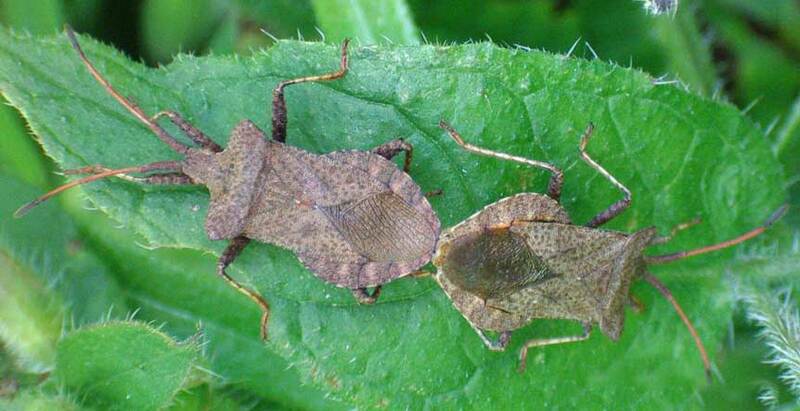 Two Squash Bugs, Coreus, were mating on vegetation on the verges of the Waterworks Road. 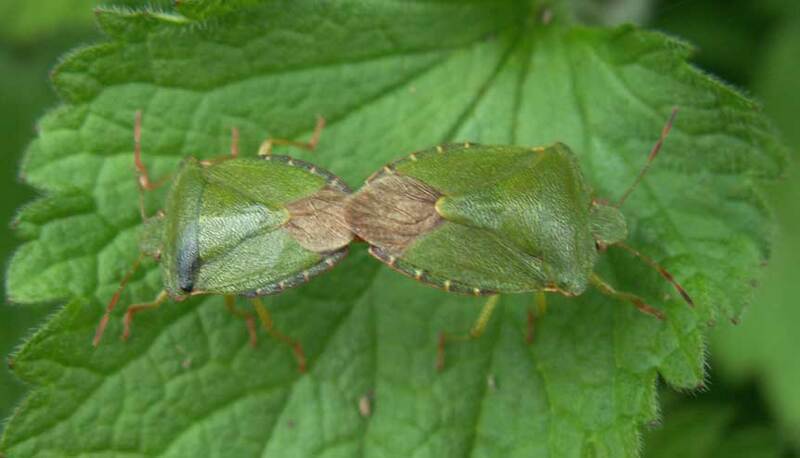 Common Green Shield Bugs, Palomena prasina, were mating on the Stinging Nettles on the verges of the Waterworks Road. 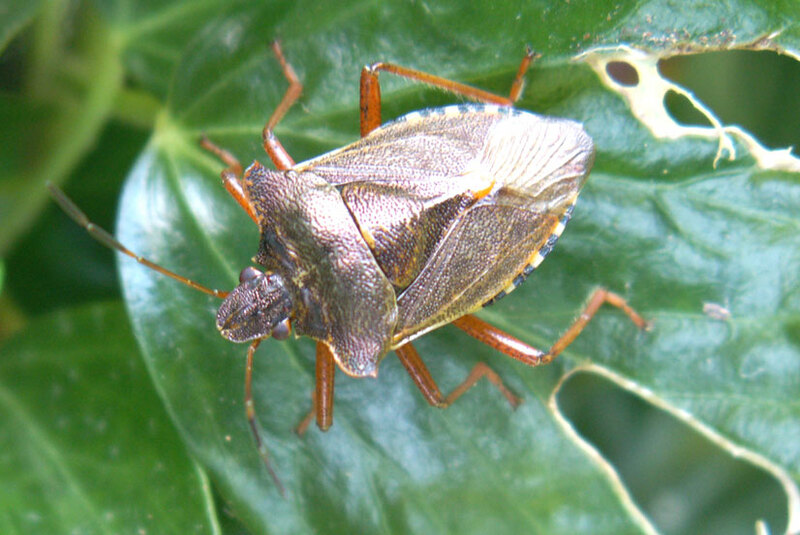 A Juniper Shield Bug, Elasmostethus tristriatus, came into our south Lancing house (TQ 185 046) on some conifer branches we are using for decorations. 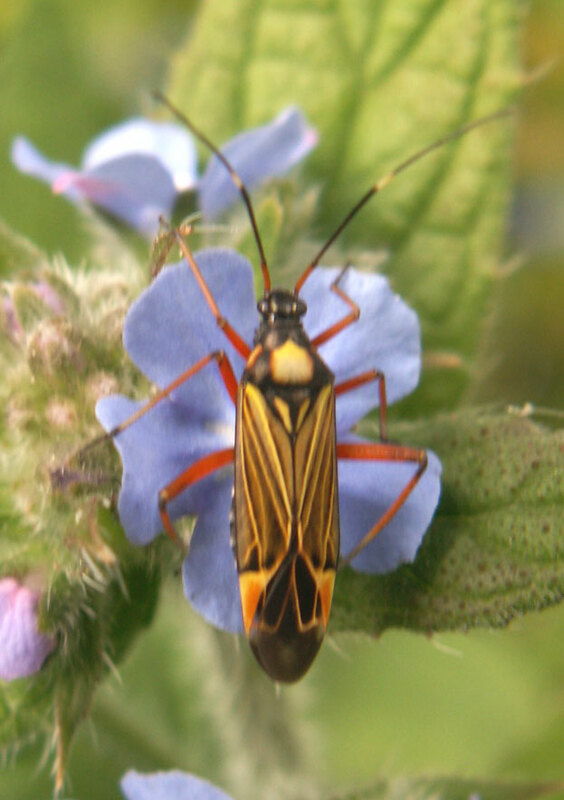 The mirid bug Deraeocoris ruber is confirmed in my south Lancing garden (TQ 185 046). 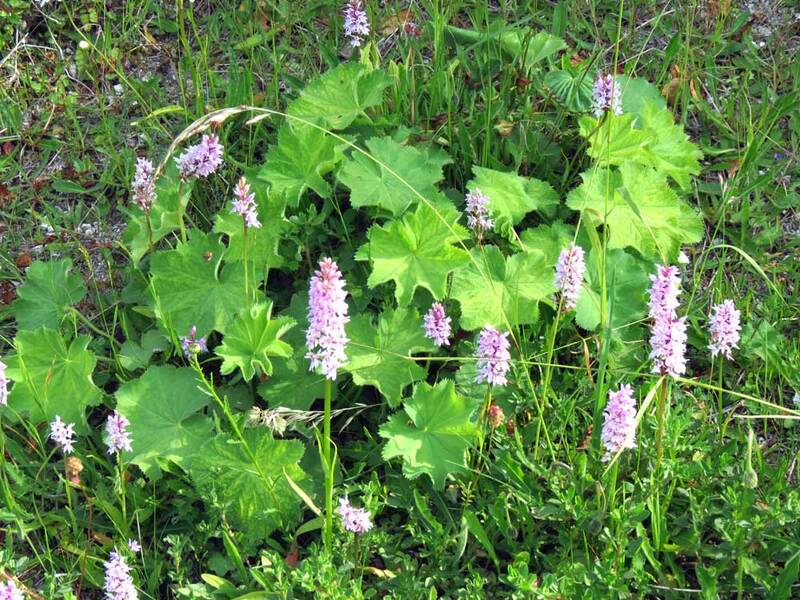 The Squash Bugs, Coreus, were mating on vegetation on the verges of the Waterworks Road. 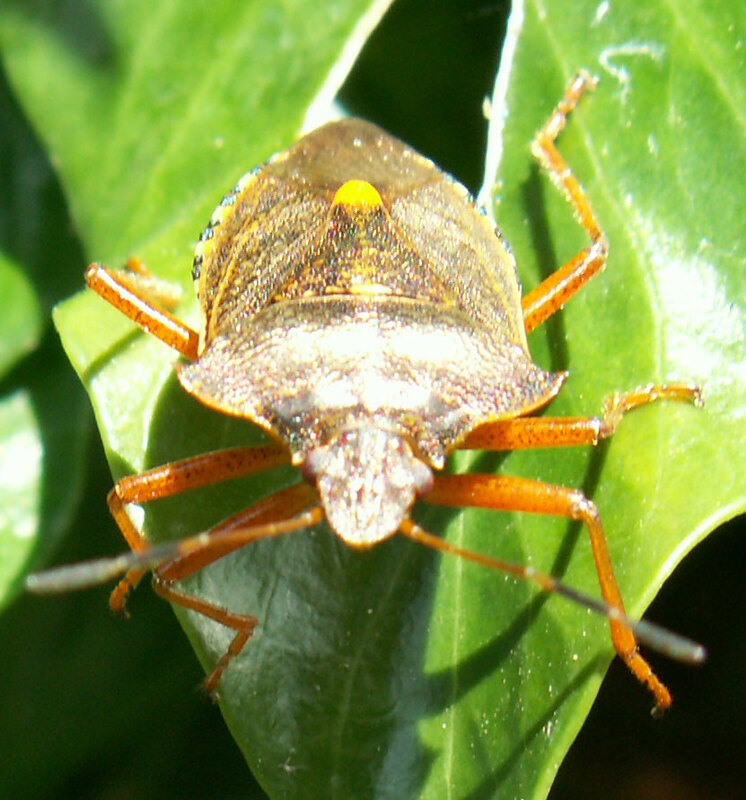 This is the commonest of the local Heteropteran "Shield Bugs" are found in the warmer months on waste land and in gardens. 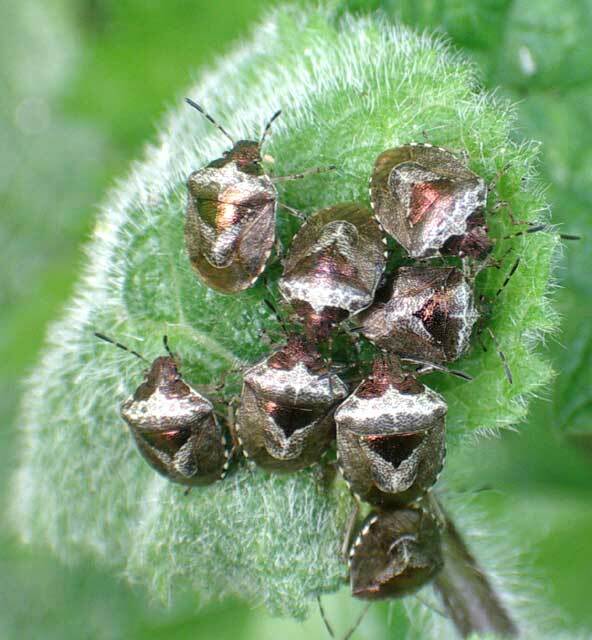 There is only one recorded local location of the Woundwort Shield Bugs, Eysarcoris fabricii, in Mash Barn Lane, Lancing. 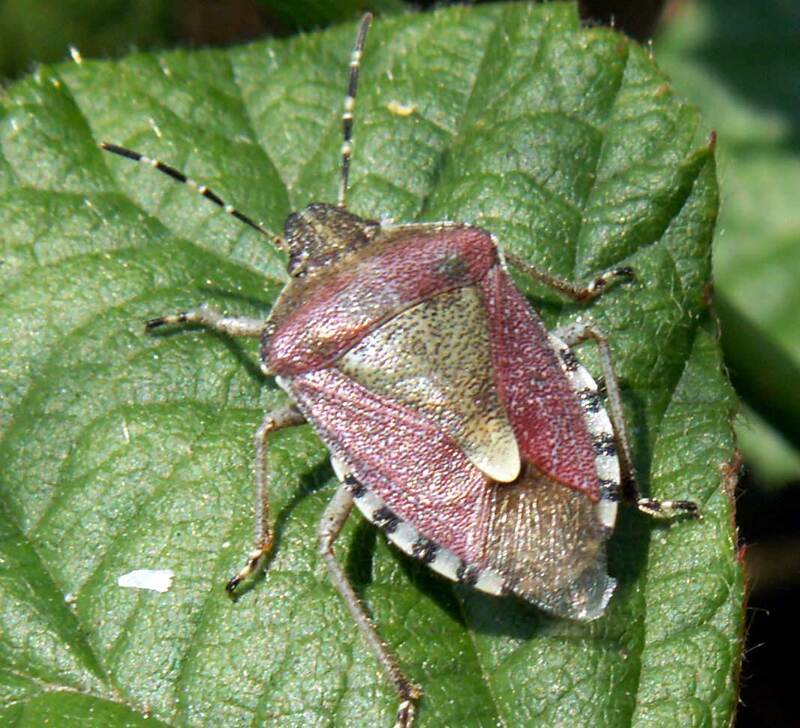 The Heteropteran "Shield Bug" in the photograph on the right was associated with an Elderberry bush on Mill Hill. Despite this, this is the Hawthorn Shield Bug, Acanthosoma haemorrhoidale. 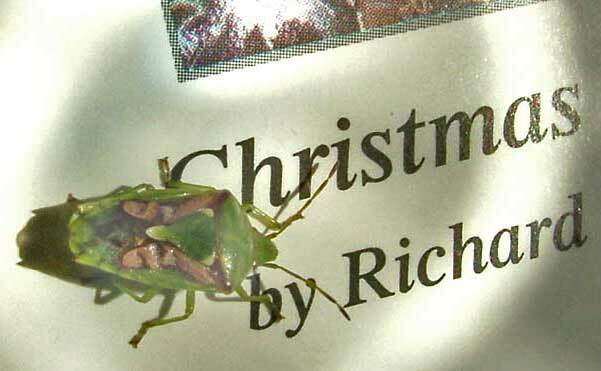 This bug is a widespread and frequently seen species. 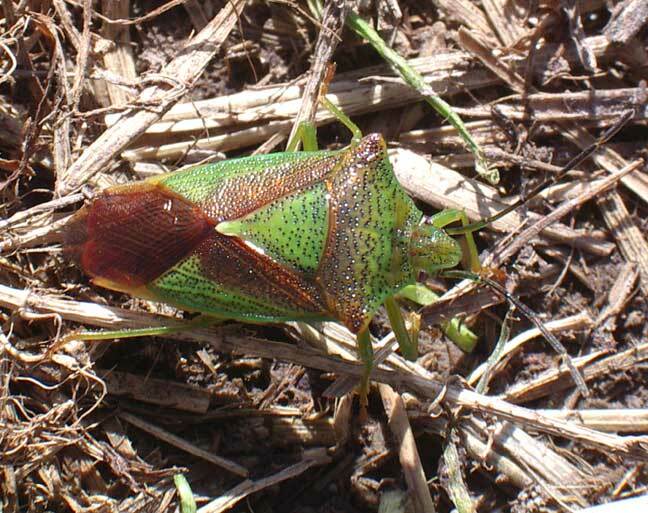 A female Meadow Plant Bug, Leptopterna dolabrata, is recorded in Malthouse Meadow, Sompting.